My trip to Jordan was an eye opener in many ways, the first was the myth that Jordan as part of Middle East would not be safe to travel. But if you have read my post “Yes I Visited Jordan & Love to Tell The Tale“, then you will realize how peaceful and friendly Jordanian people are. 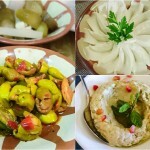 The second myth was that as Jordan is in Middle East I will have a hard time finding good vegetarian food in Jordan. But if you have read my post about Vegetarian Food in Jordan for Travelers, you will know that Jordan has a tradition of serving vegetarian food that is delicious, healthy and has all the necessary food groups. But my Jordan visit also blasted another myth that in a desert country like Jordan, there will be no natural beauty, forests or wildlife. 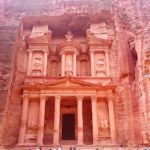 While the UNESCO world heritage site like Petra is known to all, the Eco-Tourism side of Jordan is something you must explore along with the human made attractions of Jordan. Jordan not only is full of natural splendors that are well known like the Dead Sea, but it has many oasis of nature where you can see the Wild Side of Jordan and enjoy travel in Jordan where sustainable Eco Tourism is practiced, actively involving the local communities. Let me take you to one of the Eco Tourism sites in Jordan that are actively supported by Wild Jordan, a part of RSCN or Royal Society of Conservation of Nature. As part of our Eco and Nature tour of Jordan, on invitation from Jordan Tourism Board we visited some of the Eco-tourism sites in Jordan. 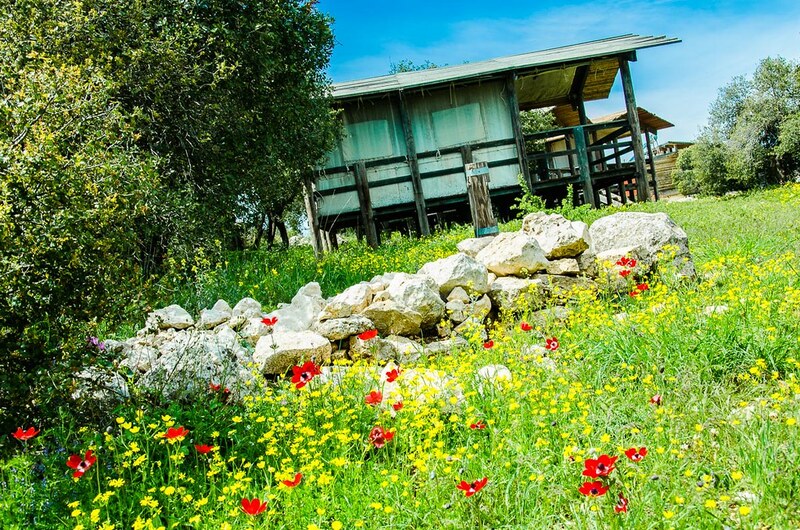 One of the most memorable visits was to the quaint Ajloun Forest Reserve north of Amman. Only 13 sq KM in area Ajloun Forest reserve holds in its winding valleys and steep hills a biodiversity that is normally not associated with middle east. Ranging in height from 600-1100 meter the weather is mostly Mediterranean and you find many trees like Evergreen Oak Quercus calliprinos, the thriving woodlands of Ajloun are dominated by Carob Ceratonia siliqua, wild Pistachio Pistacia palaestina and Strawberry tree Arbutus andrachne . The dense woods are home to a wide range of plant and animal biodiversity, like herds of wild boar Sus scrofa, the Stone Marten Martes foina, which is a carnivore that is known to be restricted to forest habitats, and the golden Jackal Canis aureus, which can still be found in good numbers in and around the reserve, as well as the Red Fox- Vulpes vulpes, Striped Hyena – Hyaena hyaena, Persian Squirrel – Sciurus anomalus, Indian Crested Porcupine – Hystrix indica, and the wild wolf- Canis lupus a close relative of man’s best friend the domesticated dog. The ground in Ajluon forest is covered with wild flowers as bright as the smile of a blushing bride. 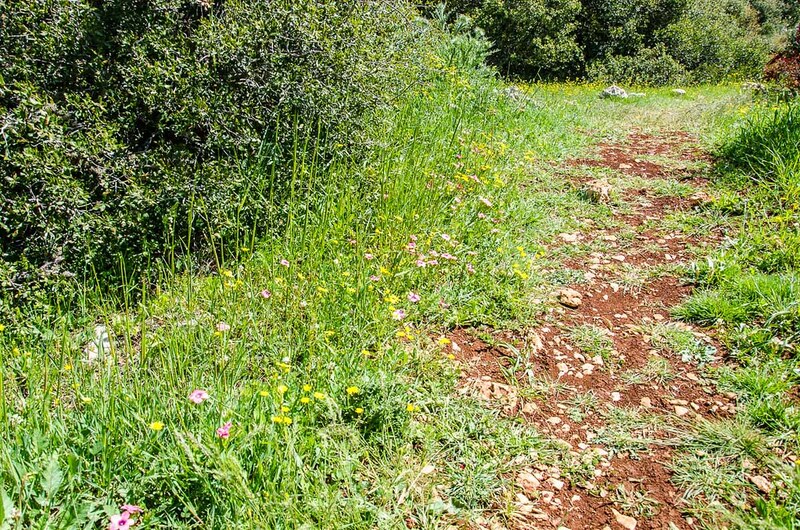 A wide variety of wild flowers thrive in Ajloun forest, including the Black Iris, many beautiful orchids and wild tulips, several of which can be found in CITES appendices. In 2000, Ajloun Forest Reserve was announced, by Birdlife International and RSCN, as an Important Bird Area in Jordan. So if you are a birder carry you binoculars and long lens, for you are in luck to click some of the rare birds of Middle-East call Ajloun woodlands their home. We reached Ajloun after about 1.5 hours of journey on almost empty road. This is a journey I will never forget. As a habit I drink 2-3 glasses of water once I get up in the morning, on that day besides my water, I also had some fresh orange juice and 2 cups of coffee. Normally I am a tea drinker but this Arabian Coffee you just cannot have one. So all these liquids in my system soon wanted to come out and water the desert around me. Had it been India I would have just asked the driver to stop the car, and just followed example of Shree Nitin Gadkari, and enriched the Jordanian Soil. But I was not sure what the protocol of travel and toilets in Jordan is so I asked our driver to stop the car at the sight of first available toilet. Which never came in sight for the next 1.5 hours, till we reached the Ajloun Forest Reserve and I just jumped from the car even before it was parked and ran towards the restrooms. But that dear friend is another story. Though you are welcome to read my post about Travel and Toilets in India, to understand why it is such a big deal in India. As I was under too much pressure ( pun intended ) we missed the Ajloun Castle that is on the way. 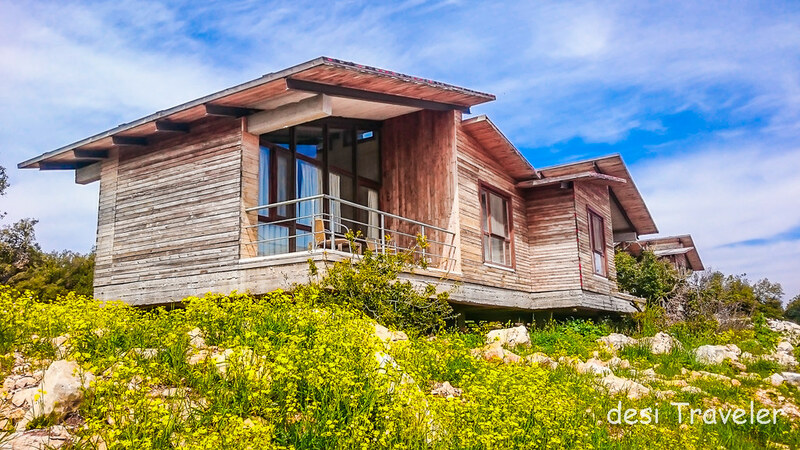 It was a beautiful day at the Ajloun Forest Reserve, where a set of cottages sit atop a small hill surrounded by greenery. The wild flowers were in full bloom putting to shame the best of manicured lawns I have seen. 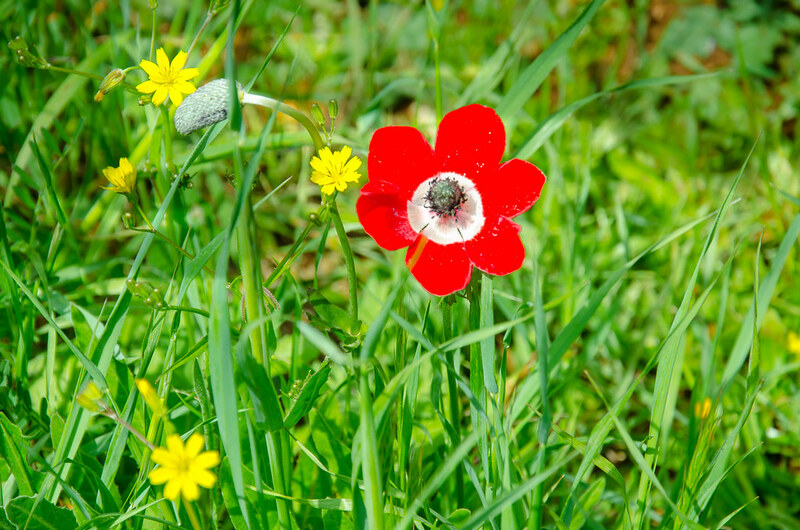 There is something about wild flowers that there civilized cousins can never have and why not when the red flowers are of the Wild Poppy. Nobody waters them or worries about the pests and weeds around them, there is no sowing of seeds, worry about frost or weather suddenly getting very hot, yet every year as if by magic they come out from nowhere, smiling at you from a corner you least expect. Well as they say mother nature knows best and that is the importance of forests and woodlands like Ajloun Forest Reserve, in a small area of 13 sq km you can observe a plethora of wild flora and fauna that has vanished from large stretches of land. 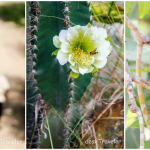 By studying these wild plants and animals we get some idea how the place looked years ago and how we need to make sure that we preserve it for our future generations. As I clicked many pictures that I shared on Instagram also it was a tough decision to click by phone and share it immediately or to click with my Nikon D700o and wait for the blog. So here I am giving you two pictures one clicked by Sony Xperia Z3 Compact and one by my Nikon D7000, and 18-105 lens. Can you tell which one is which ? These islands of biodiversity like Ajloun Forest Reserve are enclaves to preserve gene pool that no lab can replicate. No matter how many Jurassic Park movies are made we are still a long way from bringing back the lost species. Till then let us preserve or wild lands and Wild Jordan seems to be doing a great job at it. 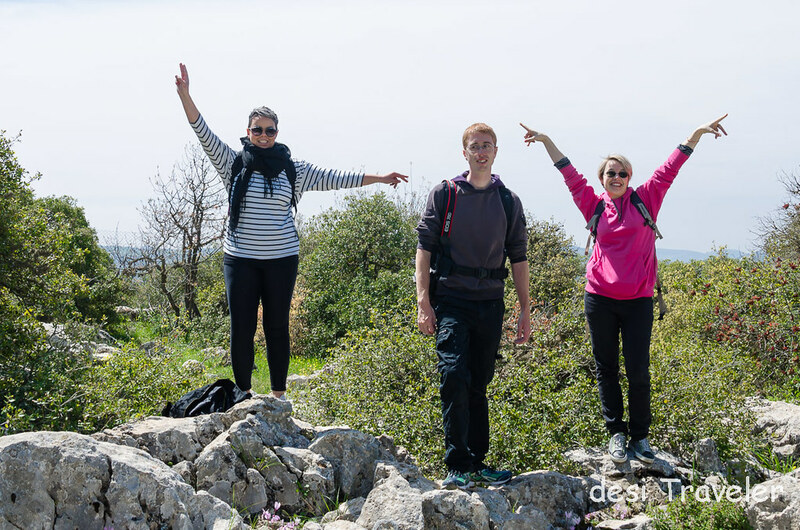 There are many trails that start at the Ajloun Forest Reserve tourist center some of them are easy and self guided with help of the signs along, and some of them you need a guide to take you as the path goes through dense forest. 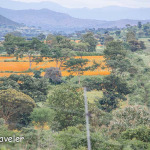 Some of the popular trails are Roe Deer Trail, Soap Makers Trail, Rock Rose Trail, The Houses Trail, Orjan Village tour etc. each trail takes you though the forests that grows naturally and is protected by law. Depending on the trail besides the forest you get to see soap making, meet local Bedouin folks, or simply enjoy the hike while keeping an eye for the wild birds and animals. 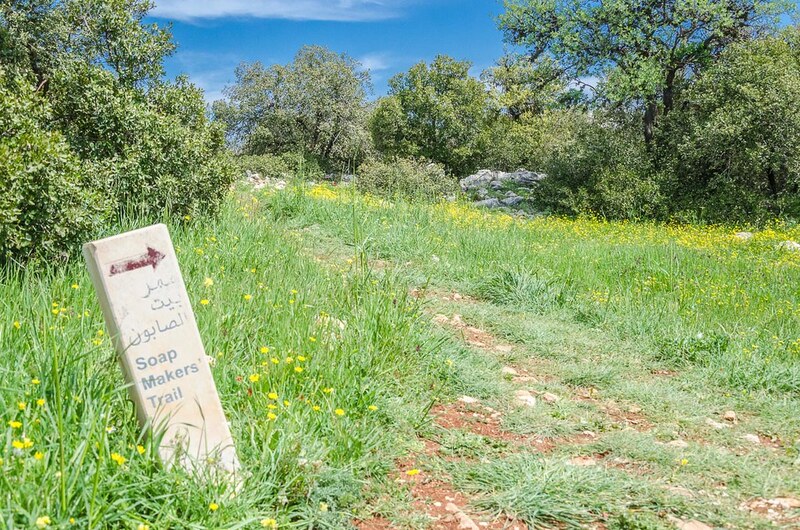 The trail we did in Ajloun Forest is known as Soap Makers Trail and covered only a very small portion of it, but still we got a good idea about what the forest is about. The Soap Makers trail passes through thickets of Oak trees whose gnarled trunks give away their age, every now and then you come across strawberry trees, wild pistachios and other local trees. At times you need to bow down to pass under the branches that seem to be telling you something. 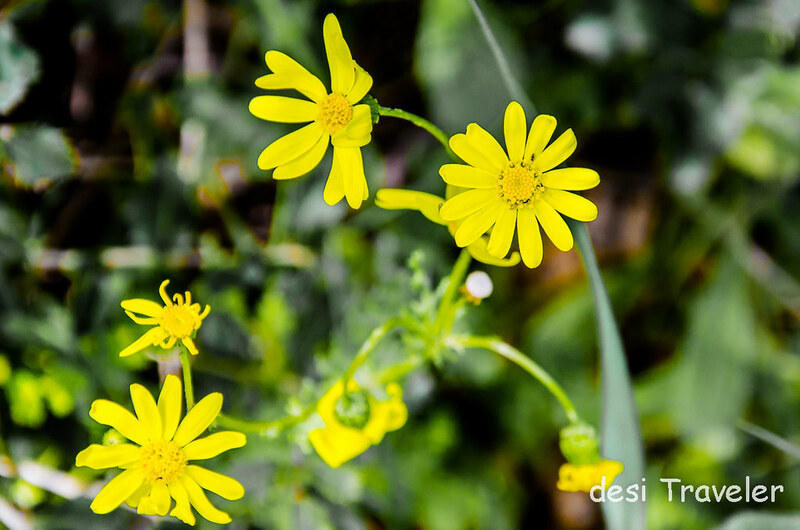 All along wild flowers in mauve, yellow, red shyly smile at you, just like village urchins who want their pictures to be clicked but are too shy to look into the camera. The trails are not tough but you still need to be careful as at places the soil is loose and covered with fallen leaves, hiding the next step. At places you are almost on the edge of mountain and at places you walk on a narrow but clean path. 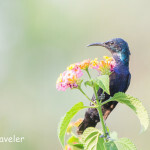 Overall an enjoyable experience if you love hiking in the woods, listening to birds around you and the odd butterfly that refuses to rest even in the middle of the day as there are many flowers that are waiting for her. So dear reader if you are a nature lover and enjoy fresh air, some outdoor exercise a possibility to see some rare wildlife make sure you visit Ajloun Wildlife Reserve north of Amman. 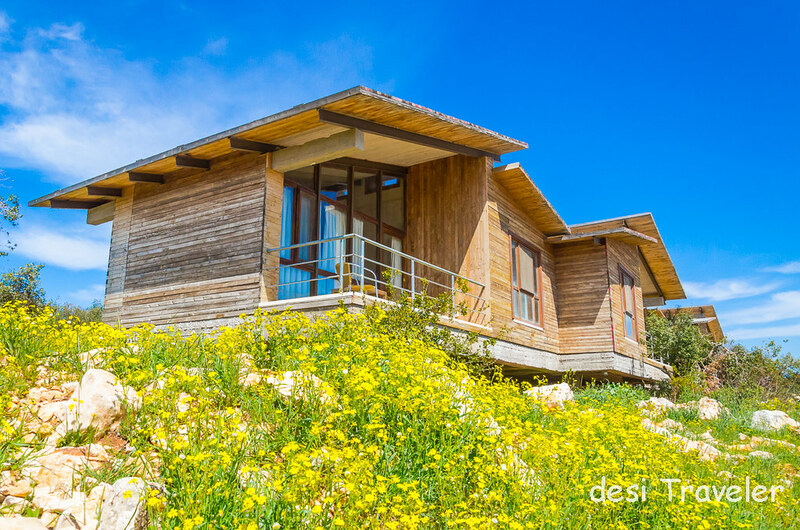 The tourist center has some eco-friendly cottages, a soap making facility where local women make soap using the natural oils extracted from Olives and aromatic herbs. Do buy a few bars at the visitor center shop as the money goes back to the local economy. How to reach Ajloun Forest Reserve: You can drive or take a cab to Ajloun from Amman, the distance between Amman and Ajloun Forest reserve is 80 KM and you will need about 1 hour 15 minute for the same by car. Local buses are available and you can check this link for information. 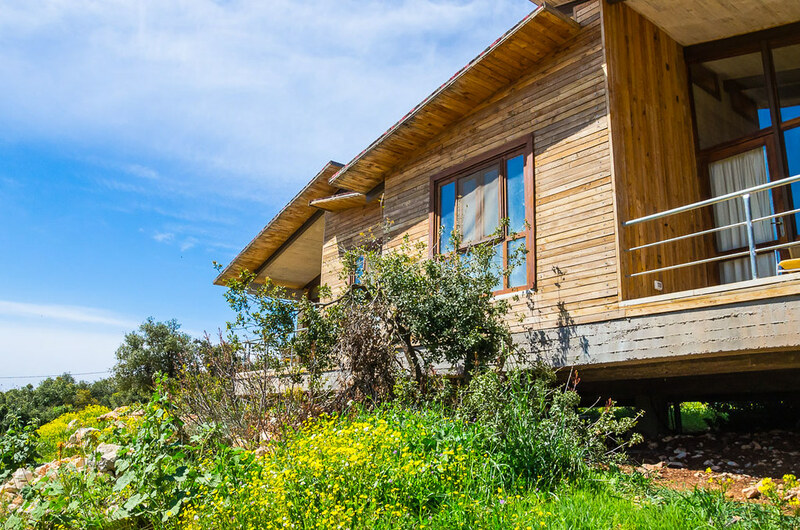 Besides the eco-friendly cottages at the tourist center, you can also relax at the deck that offers 360 degree view of the forest and do some shopping of artifacts, handicrafts, soaps, dried flowers and herbs at the small shop at the Ajloun Forest Reserve. This is fourth post in my series on Visiting Jordan, where I was a guest of Jordan Tourism Board. 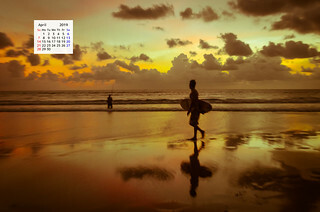 OMG, I want to visit this country now. It’s beautiful. Btw, I can’t find any difference in your shots. All are beautiful, but first is out of this world. Lovely trail. These are wonderful initiatives. Yes, RSCN Jordan is doing a great job in conserving nature..
Nice artice and nice memories.. 🙂 Wish we could visit Jordan again..
Lovely post! You busted quite a few myths there. When I imagined Middle East, only vast stretches of desert and Arabian Nights came to my mind, but this post gave a whole new perspective. Would love to visit Jordan some day, and obviously write about it. I totally agree than wild flowers are a thing of unmatched beauty. A marvel of mother nature is what I call them. No one put the seeds, no one watered them or put manure for them to flourish. Yet, the seeds sprout, flowers blossom and enchant us.